5000 BC is roughly when the first Indo-Europeans started invading Europe. We say "invading" because we know people were there before them. Amongst this lovely bunch of hooligans, from the steppes of Central Asia, there was a group which settled on the northern edges of the Alps. The Celts. Back then, they weren't known as the Celts and the two earliest "Celtic cultures", that we know about, are often called the Hallstatt and the La Tène Cultures. Irrespective of the naming issue, this bunch did well and by the 3rd century AD they'd established quite a track record. They muscled the Etruscans out of most of northern Italy, had taken over most of Gaul as well as large swathes of the Iberian peninsula, Southern Germany, the British Isles, parts of modern day Slovenia, Bulgaria, Romania, Hungary, a fair chunk of land in central Turkey(! ), sacked Delphi in 279 BC and Rome, itself, in 390 BC. Incidentally, it's from the Greeks that the Celts get their name. The historian, Hecataeus, describes them as ''Keltoi'', the meaning of which can not be absolutely ascertained. But, seeing that they sacked Delphi, it can't have meant anything nice. Incidentally, it's from the Greeks that the Celts got their name. The historian, Hecataeus, described them as <span style="color: #6600CC;">Keltoi</span>, the meaning of which can not be absolutely ascertained. But, seeing that they sacked Delphi, it can't have meant anything nice. However, after that, the Celts slip a bit. In 192 B.C., Rome took back ''Transalpina'' and gradually took over... well ... really most of Europe and the decline of the Celts began. Now, one thing you need to know about that little superscript ʷ is that it represents something called labialisation. It means that you round your lips when making that sound, like in the English word ''quick'' which is [kʷɪk]. This is important why? You'll see. One thing you need to know about that little superscript ʷ is that it represents something called labialisation. It means that you round your lips when making that sound, like in the English word ''quick'' which is [kʷɪk]. This is important. Why? You'll see. Now things get interesting because this is roundabout the time when Goidelic (the granfer of Irish, Gaelic and Manx) and Brythonic (granma of Welsh, Cornish, Cumbric and Breton) put in for a divorce. Over a p. What happens is that Brythonic takes the kʷ sound and turns it into a p. That works because labialisation is made with the lips and there seems to have been a struggle between the labial nature of the ʷ and the velar nature of the k. It appears that the lips won and the k bit was assimilated into a p. It's like the word ''immigrate'' which comes from ''in-migrāre'' where the n has been assimilated into an m because it is immediately followed by one. Then things got interesting because this was roundabout the time when Goidelic (the granfer of Irish, Gaelic and Manx) and Brythonic (granma of Welsh, Cornish, Cumbric and Breton) put in for a divorce. Over a p. What happened is that Brythonic took the kʷ sound and turned it into a p. That works because labialisation is made with the lips and there seems to have been a struggle between the labial nature of the ʷ and the velar nature of the k. It appears that the lips won and the k bit was assimilated into a p. It's like the word ''immigrate'' which comes from <span style="color: #6600CC;">in-migrāre</span> where the n has been assimilated into an m because it is immediately followed by one. This is the reason for a great many things. For example, it is the reason why Goidelic is sometimes referred to as Q-Celtic and Brythonic as P-Celtic. 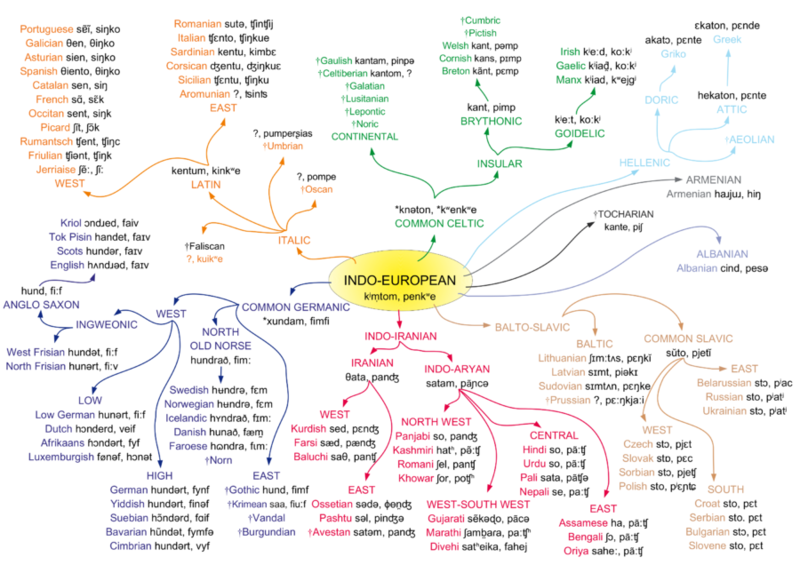 It's based on the development of the Indo-European word for 5, <span style="color: #6600CC;">penkʷe</span> which in Q-Celtic becomes <span style="color: #6600CC;">cóic</span> (remember, Goidelic dropped p) and in Brythonic <span style="color: #6600CC;">pimp</span> (remember, Brythonic kept p). That explains the P but not the Q. Well, it does explain it in Manx because <span style="color: #008000;">cóig</span> is spelled <span style="color: #6600CC;">queig</span>. It also explains some lovely loanwords like <span style="color: #008000;">Càisg</span> for Easter which is derived from ecclesiastical Latin <span style="color: #6600CC;">Pascha</span> (cf. Sp. <span style="color: #6600CC;">Pasqua</span>) or even the twice borrowed <span style="color: #6600CC;">Patricius</span> who shows up as earlier <span style="color: #6600CC;">Cadrach</span> and later as <span style="color: #6600CC;">Pádraic</span> > <span style="color: #008000;">Pàdraig</span>. Even some relatively late loans show this change, such as Norse <span style="color: #6600CC;">upsi</span> ''mature saithe'' which was borrowed as <span style="color: #6600CC;">ugsa</span> (and in some areas then metathesized to <span style="color: #6600CC;">ucas</span>). Occasionally this seems to involve a p/g change, like in <span style="color: #008000;">giseag</span> which also shows up as <span style="color: #008000;">piseag</span> - the same word as Irish <span style="color: #6600CC;">piseog</span> which was borrowed into English as ''pishogue''. This shows up in Middle Irish as <span style="color: #6600CC;">piseóc, pisóc</span> with pretty much the same meaning. It also makes for a headache because modern Irish and Gaelic, as we have just seen, do not retain the kʷ sound but sometimes borrow words from English which has kʷ. How to borrow? Do you borrow the sound kʷ and change the set of sounds in these languages? Or, do you adjust to Irish/Gaelic spelling? Or, do you try to come up with your own word? Tricky one. Traditionally, the second option seems to have prevailed. For example, Irish borrowed Quaker as <span style="color: #6600CC;">Caecar</span> and Gaelic turned a quadruped into <span style="color: #008000;">ceithir-chasach</span>. But, lately, words like <span style="color: #6600CC;">quinín</span> 'quinine' have showed up in Irish. and Gaelic now boasts <span style="color: #008000;">cuaraidh</span> for 'quarry' and <span style="color: #008000;">cuòta</span> for 'quota'. Really tricky one. etc. etc. The tricky bit is that it translates as "a sheep to Trebopala and a pig to Laebo'. And, as we all know, the great clue to something being an old Celtic language is the loss of p '''before''' the stage where Brythonic reinvents it. Yet, here we have <span style="color: #6600CC;">porcom</span> 'pig' ... The answer? Actually, we don't have an answer except that there may be a question mark over Lusitanian being a Celtic language. If you find out, publish and you'll be famous! etc. etc. The tricky bit is that it translates as "a sheep to Trebopala and a pig to Laebo'. And, as we all know the great clue to something being an old Celtic language is the loss of p (that is, before the stage where Brythonic reinvents it). Yet, here we have porcom 'pig' ... The answer? Actually, we don't have an answer except that there may be a question mark over Lusitanian being a Celtic language. If you find out, publish and you'll be famous! Occasionally this seems to involve a p/g change, like in giseag which also shows up as piseag - the same word as Irish piseog which was borrowed into English as pishogue. This shows up in Middle Irish as piseóc, pisóc with pretty much the same meaning. Air a tharraing à "http://akerbeltz.org/index.php?title=Minding_Your_Ps_and_Qs_or_Why_Porcom_is_a_Headache&oldid=3958"
Chaidh an duilleag seo a dheasachadh 4 dhen Chèitean 2017 aig 15:18 turas mu dheireadh.